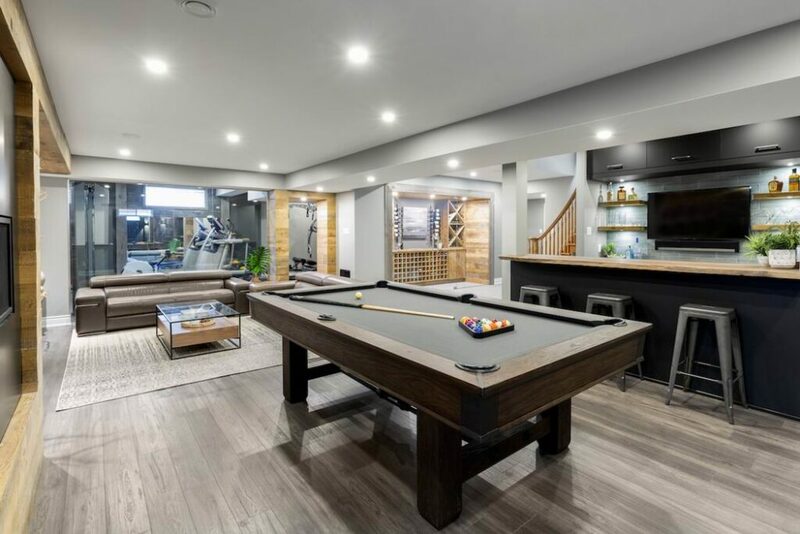 Minto Communities had the most wins of the night with 6, including 3 for the 2017 dream home. 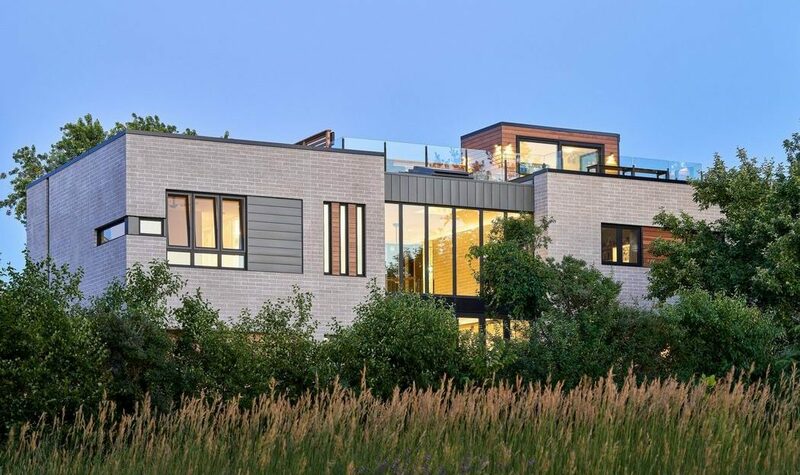 Newcomer Neoteric Developments won 4 awards, including the People’s Choice and 2 others for this home. 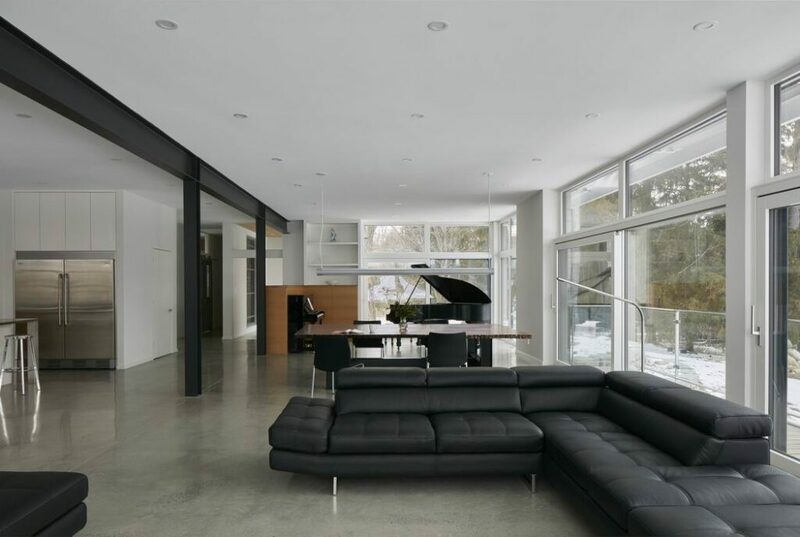 Linebox Studio and The Lake partnership scooped up 3 awards for a home overlooking the Ottawa River. RND Construction’s green model the Meadow at Riverpark Green won 3 awards, with 2 shared by Christopher Simmonds Architect and 1 by Deslaurier Custom Cabinets. 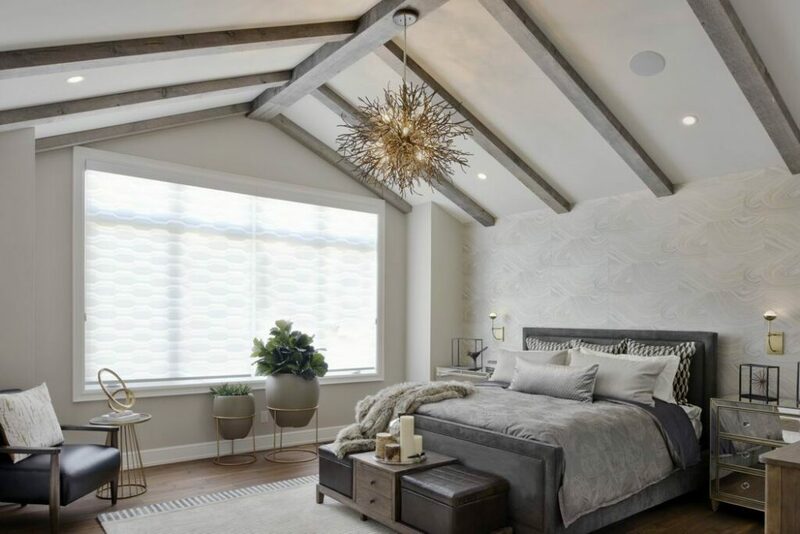 eQ Homes was named production builder of the year and won (along with Hobin Architecture) planned new community for Greystone Village among its 3 awards. Hobin Architecture won 5 awards all together, including built new community for the Haven, a rental community in Barrhaven. Lagois Design-Build-Renovate was named renovator of the year and won the renovation $200,001-$350,000 category. 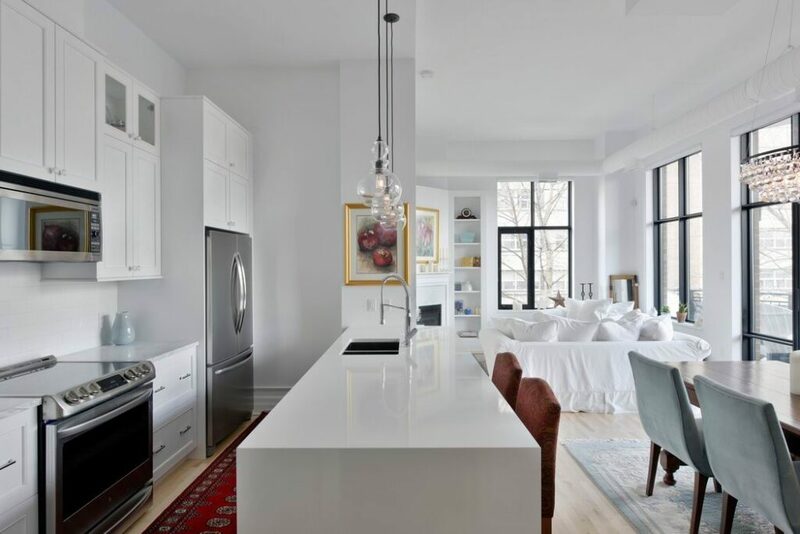 Amsted Design-Build won 3 awards, including 2 for this condo renovation. 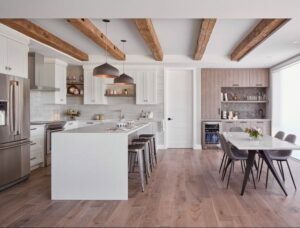 Laurysen Kitchens’ wins included 2 for the 2017 Minto dream home as well as a custom kitchen category for this project. A kitchen that ‘blew my mind,’ according to one of the judges, was 1 of 3 trophies for Astro Design Centre. 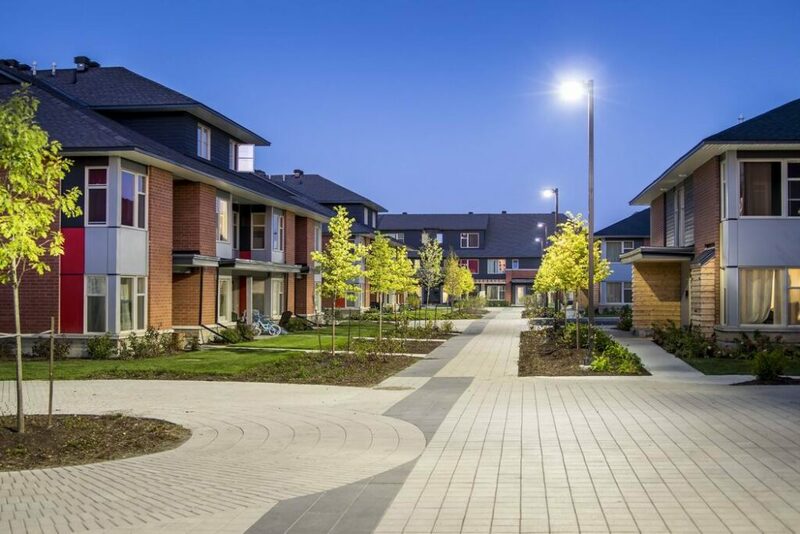 Variety was the key at the 2018 Ottawa Housing Design Awards: variety in style, variety in materials and variety in the winners awarded trophies at a gala dinner Saturday night. 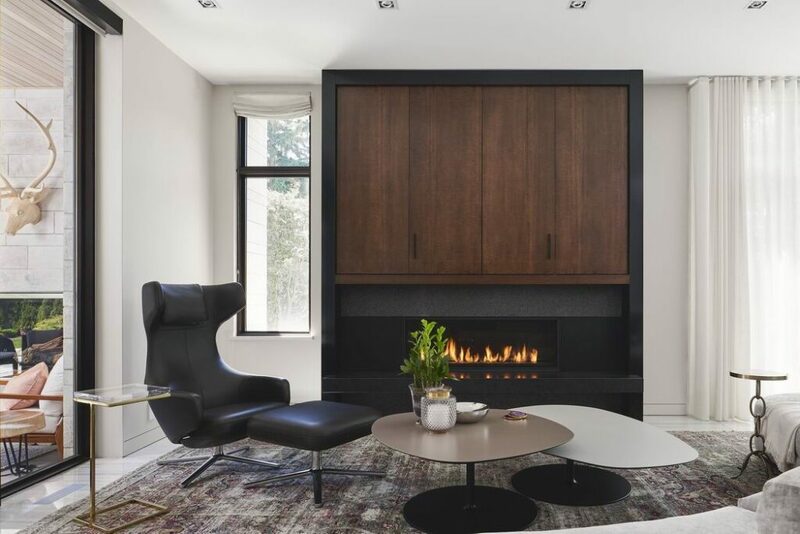 From soothing neutrals to neon-like lighting, minimalist modern to classically traditional, and casual rustic to sophisticated elegance, the winning projects offered something to appeal to just about everyone. 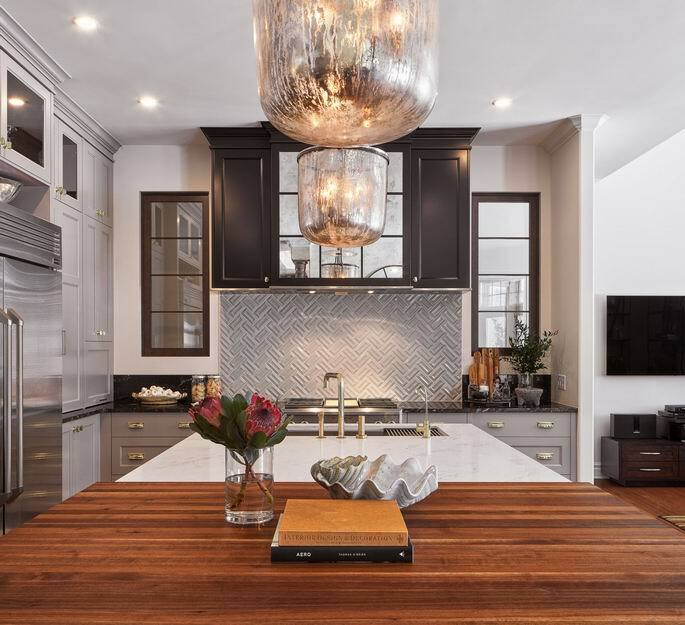 It was the 35th anniversary of the awards for the Greater Ottawa Home Builders’ Association (GOHBA) and it was marked with a glitzy event where gold and stone decor mimicked the contrasting trends of this year’s entries. About 500 industry representatives from builders to designers, architects and suppliers gathered at the Shaw Centre for the event, where some 40 companies were named winners in 57 categories. Unlike recent years, there was no one company that dominated in the winner’s circle. 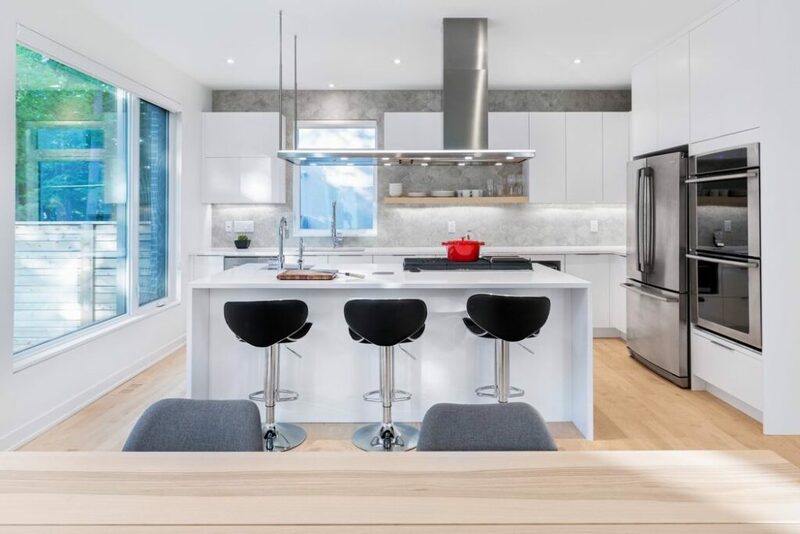 Several scooped up multiple trophies, with RND Construction and Hobin Architecture winning five apiece and Christopher Simmonds Architect and Linebox Studio grabbing four. Minto Communities claimed a slight edge on the competition with six wins. Winner: production home, single detached, 3,501 sq. ft. or more; custom bathroom, 100 sq. 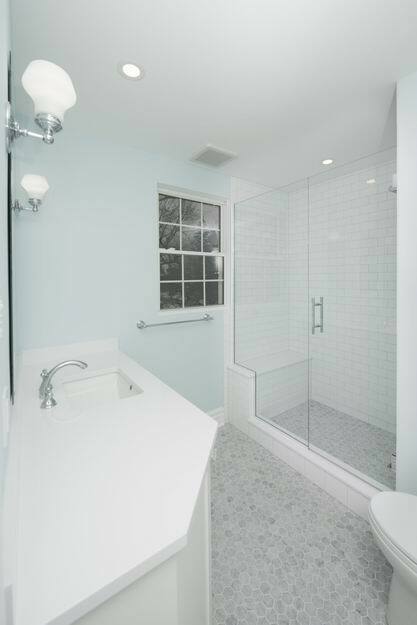 ft. or less, contemporary; & custom bathroom, 101 sq. ft. or more, traditional. 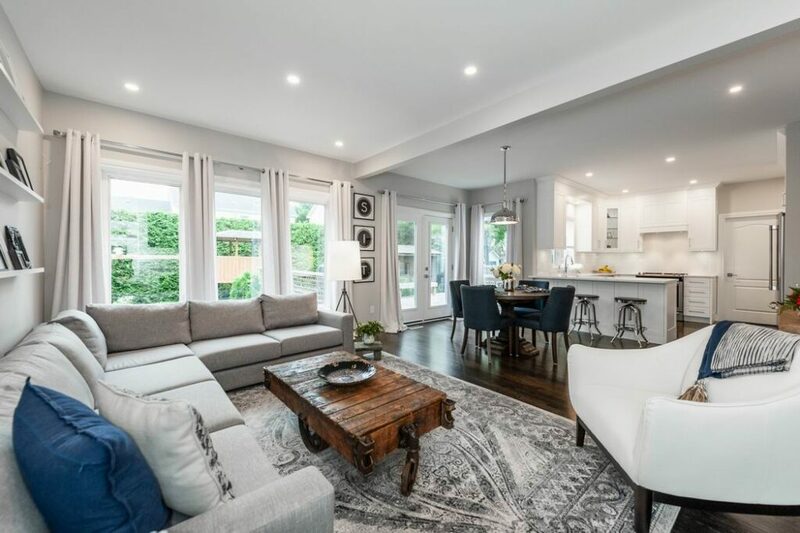 Minto’s awards included both the condo building categories, for its UpperWest and Beechwood projects, and three for the 2017 dream home built as part of the CHEO Dream of a Lifetime Lottery fundraiser. 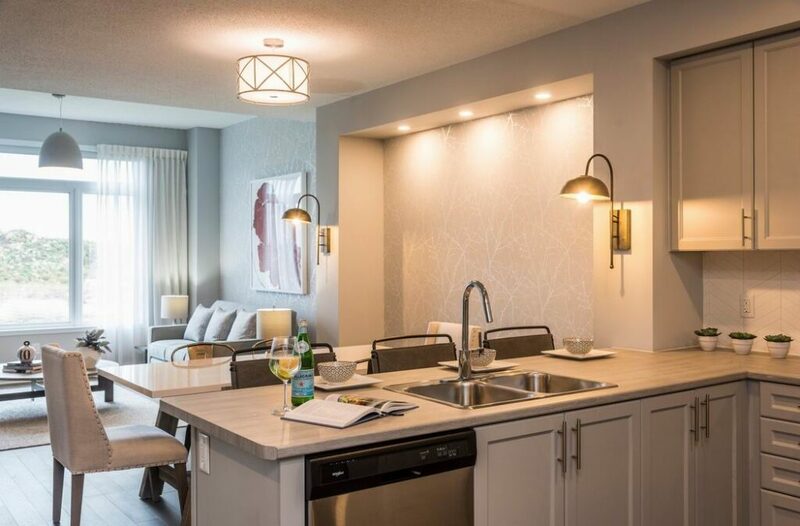 But the surprise of the evening was newcomer Neoteric Developments, which won an impressive four categories in its first attempt at entering the awards, including the prestigious Ottawa Citizen People’s Choice Award, which is voted on by the public. 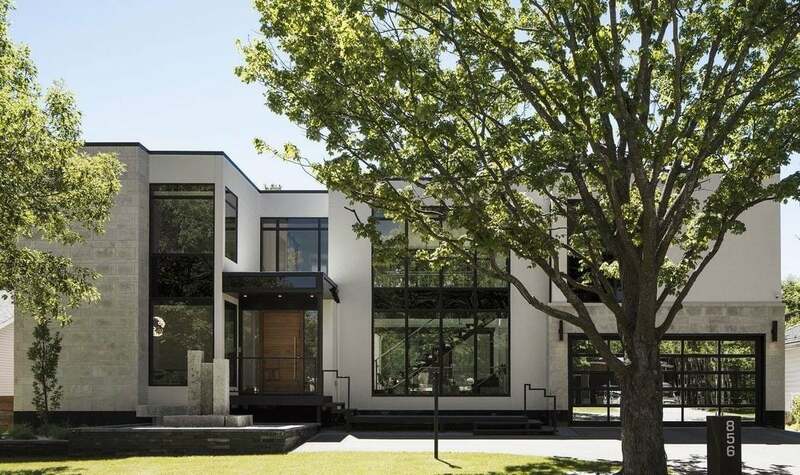 Winner: Ottawa Citizen People’s Choice Award; exterior living space; & powder room. Three of Neoteric’s wins were for the same project, which happens to be the home of company founder Shneur Bielak. 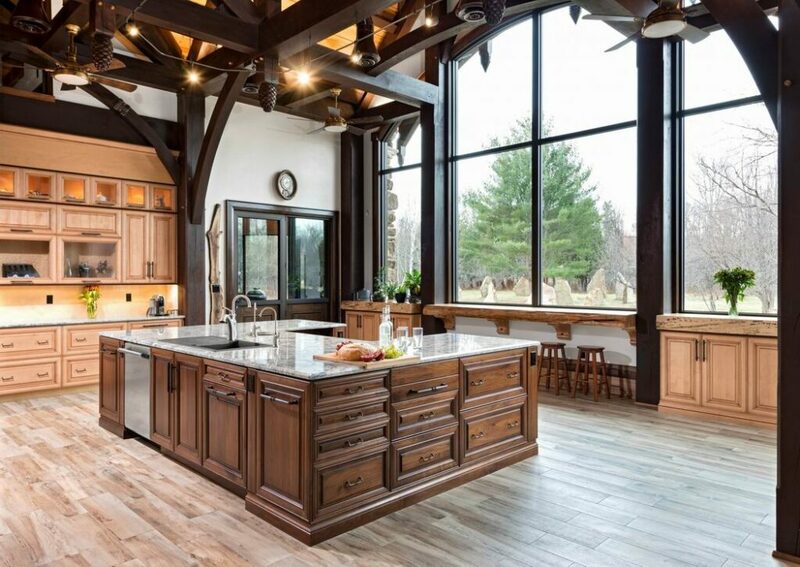 Several other companies had multiple wins, including eQ Homes, which was named production builder of the year, Amsted Design-Build, Laurysen Kitchens, Astro Design Centre and The Lake Partnership — all of whom won three awards. Interestingly, many of these companies’ projects won more than one category. 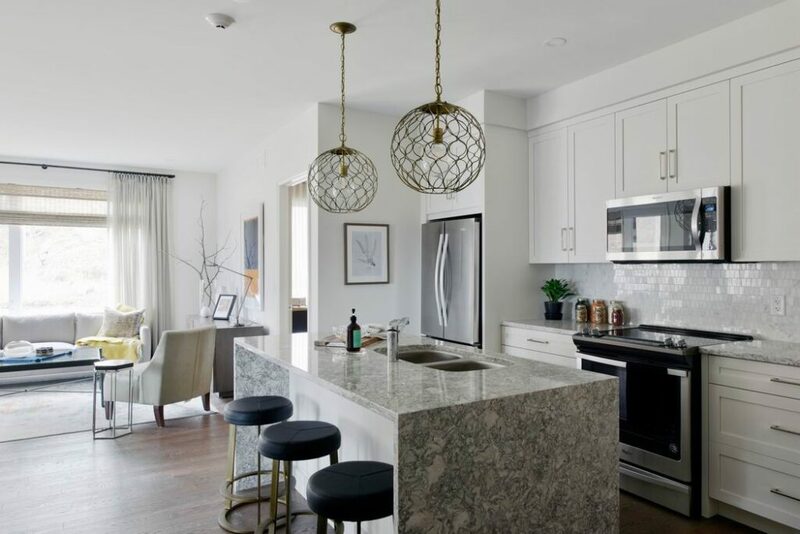 Amsted, for instance, won both a kitchen category and renovation under $100,000 for a condo transformation that turned an industrial space into a tranquil retreat. Winner: custom kitchen, 180 sq. ft. or less, traditional. Laurysen’s double-win project was shared with Minto for the dream home, winning for both its main bathroom and master ensuite. 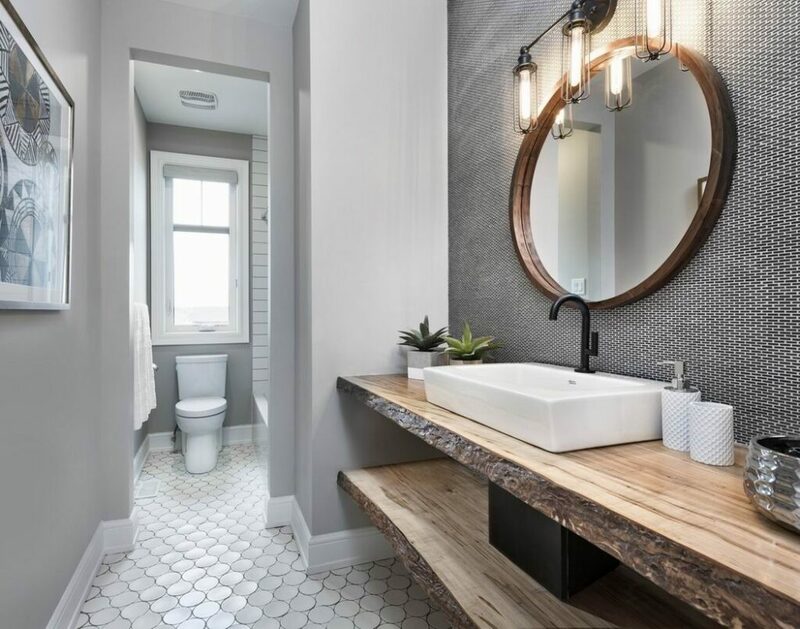 The main bathroom combined a live-edge counter with a delightful miniature brick mosaic tile in black while the ensuite incorporated neutral tones, a mid-century modern style and gold fixtures. Winner: Custom bathroom, 100 sq. ft. or less, contemporary. 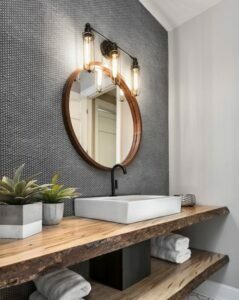 Winner: custom bathroom, 101 sq. ft. or more, traditional. Side note: Laurysen also won the kitchen category known as the John Laurysen Memorial Trophy, which honours the company’s founder. 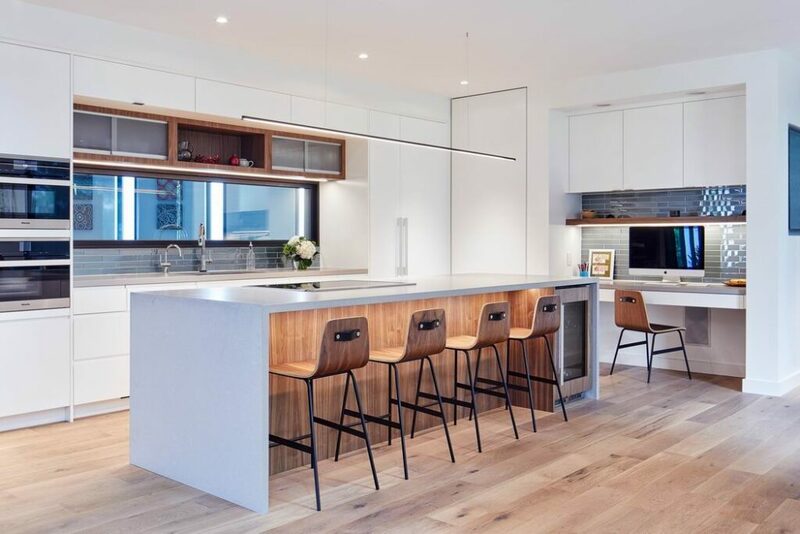 Fittingly, the kitchen that won was designed by Laurysen’s daughter, Caroline Castrucci. Winner: Custom kitchen, 241 sq. ft. or more, traditional, $75,001 and over — John Laurysen Memorial Trophy. 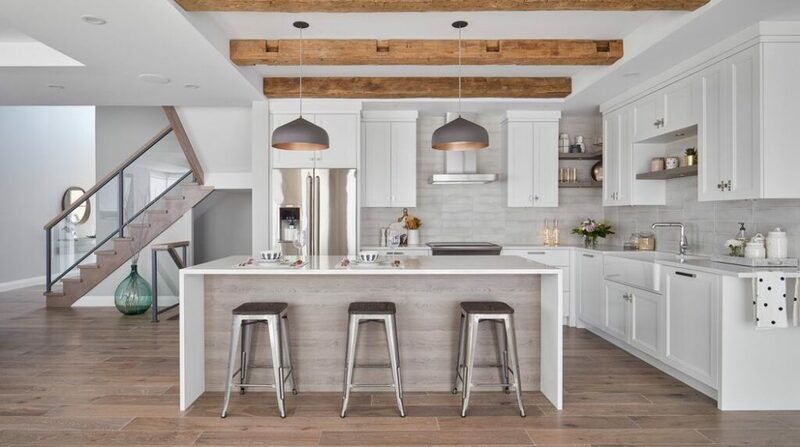 It boasts open post-and-beam ceilings and pairs maple and walnut that is glazed and distressed to match the ceiling. The space was designed to complement its rural locale, along with meeting the needs of a family member who uses a wheelchair. 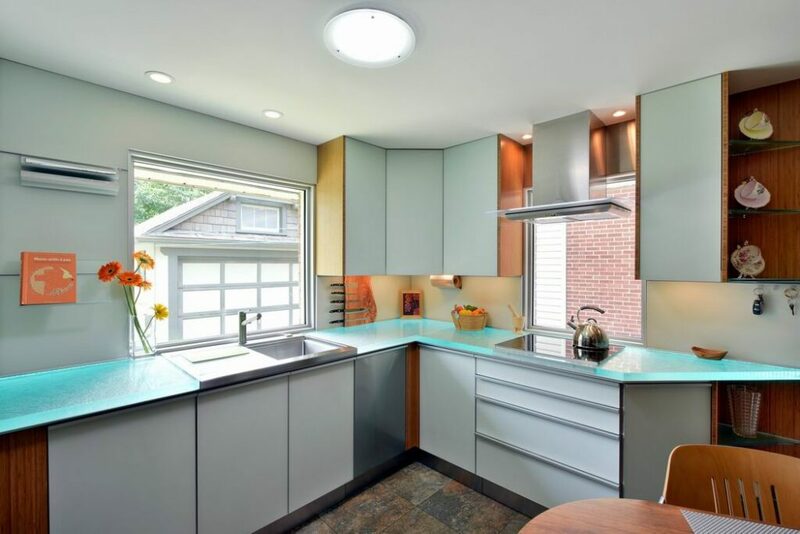 Winner: Custom kitchen, 241 sq. ft. or more, contemporary, $75,000 and under. Winner: custom bathroom, 101 sq. ft. or more, contemporary. 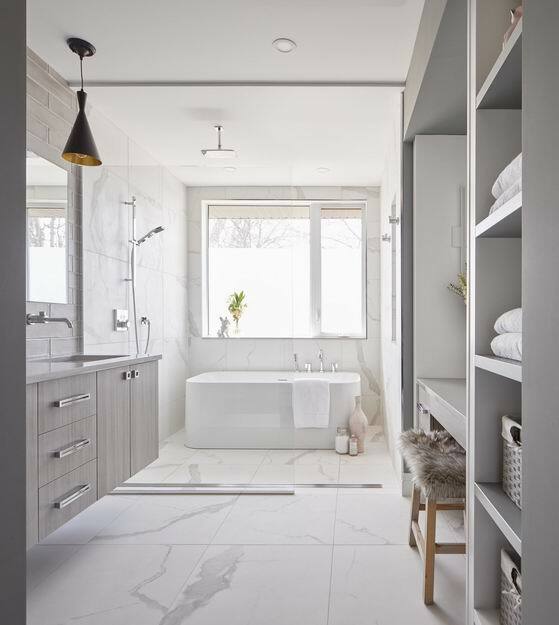 Astro’s double-win project featured a kitchen and an ensuite designed by Julia Enriquez. 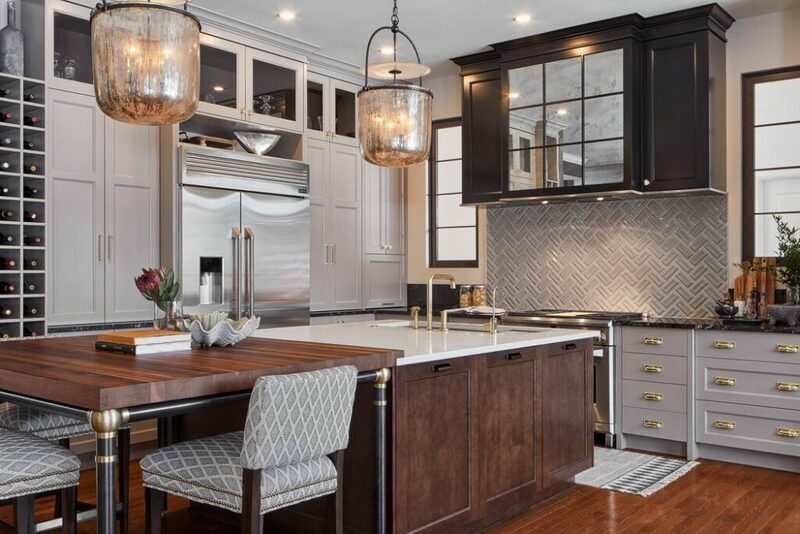 “It felt very comforting and warm,” Hewett said of the kitchen, which needed to provide some “wow” while keeping to a tight budget. 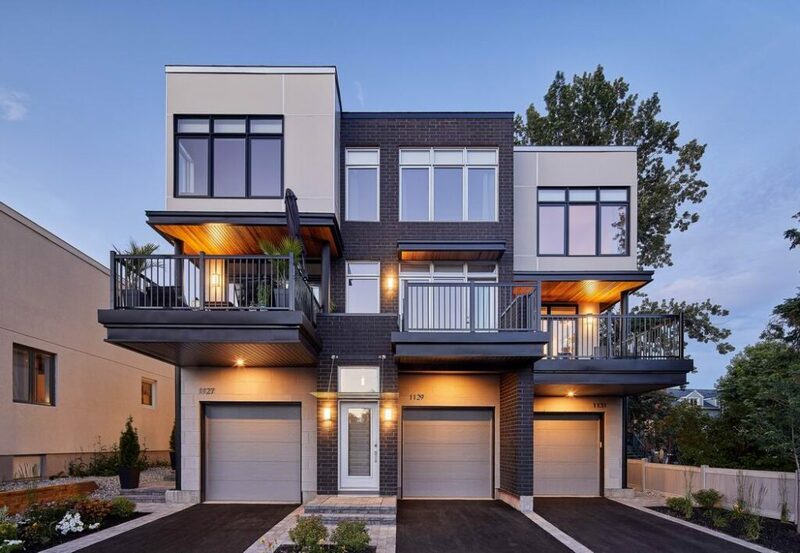 Winner: Custom urban home, 3,501 sq. ft. or more. 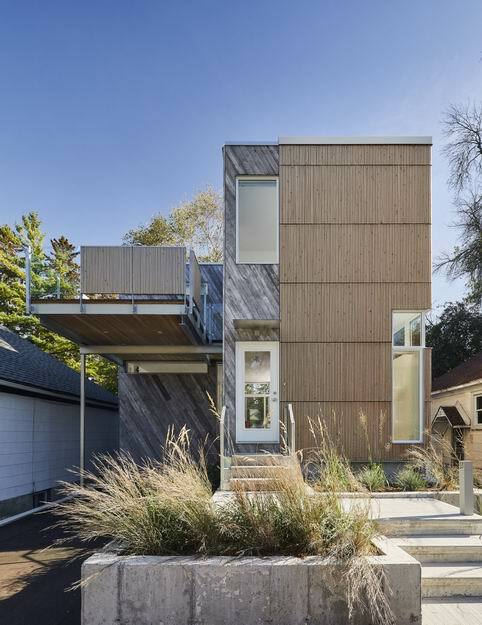 And The Lake Partnership won three awards, in conjunction with Linebox, for a custom home that really stood out for the way it worked with an odd-shaped lot. Winner: Custom kitchen, 241 sq. ft. or more, contemporary, $75,001 and over. 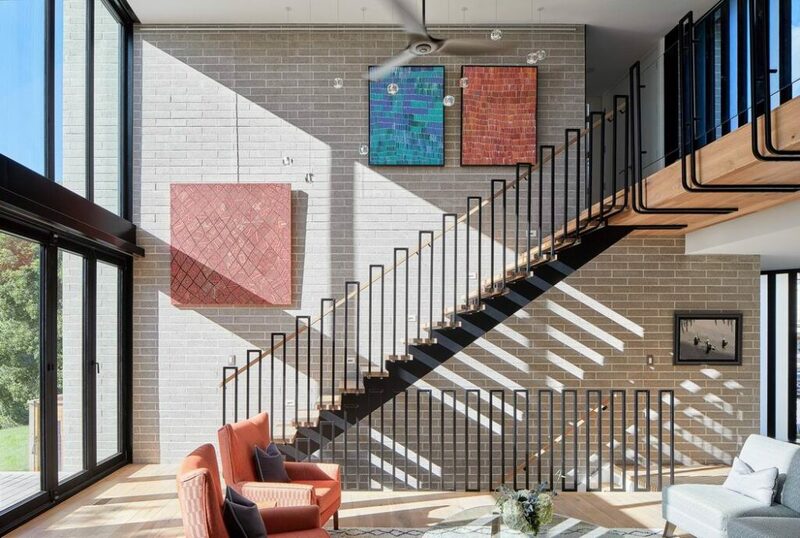 The project won its custom home category, as well as for its kitchen and for housing details for a fun staircase that Lemke likened to paper clips. Worth mentioning: While not a double project winner, of note was Hobin’s double win in the new community categories, where the firm claimed both the planned and built new home community trophies, sharing the planned one with eQ (more on that below). “It was exciting to win both new community categories,” Hobin architect Gord Lorimer said after the event. 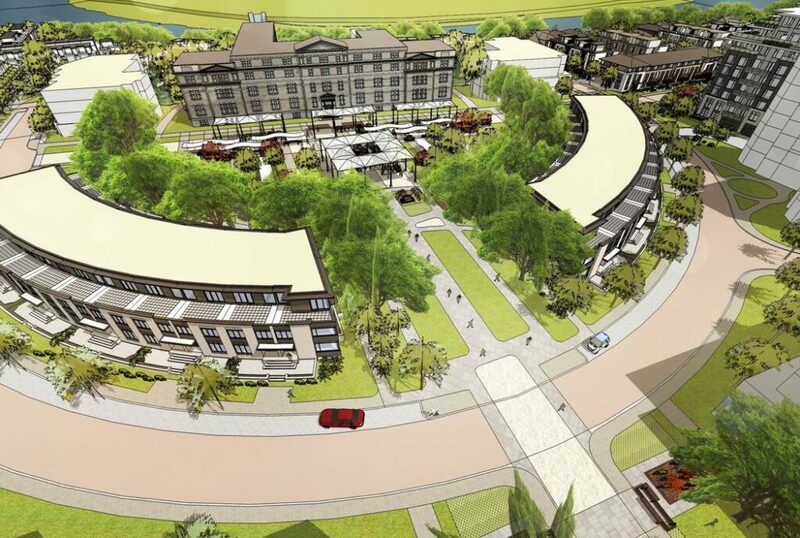 “While Greystone and the Haven are very different, they share a similar design approach, which is based on a strong central organizing principle that is more about the space between the buildings than the buildings themselves. Barry Hobin also pointed to the significance of the Haven winning as a not-for-profit, affordable housing project. “To win against the marketing campaigns of numerous developer projects is extremely gratifying,” he said. RND was named custom builder of the year for the third time in the past five years. RND founder Roy Nandram had a good night, capturing both of the green category awards — it’s a category he has dominated for years and speaks to his leadership in sustainable building. Winner: Production home, single detached, 2,601-3,500 sq. 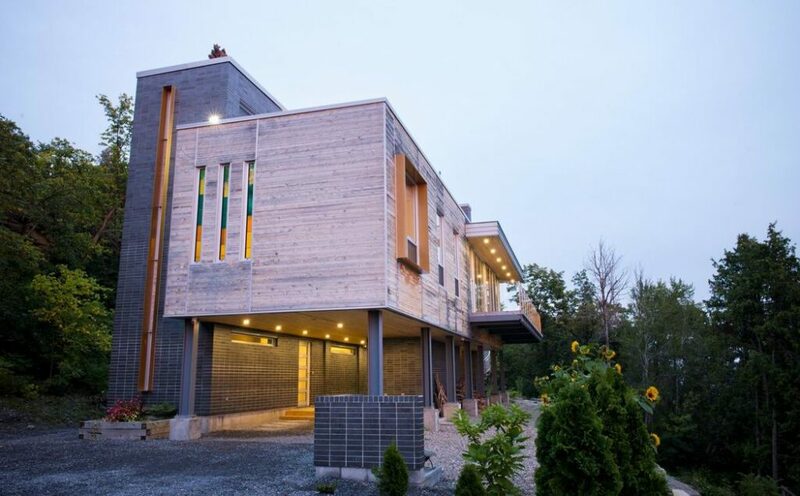 ft., $750,001 and over; green production home of the year. Winner: custom kitchen, 181-240 sq. ft., contemporary. 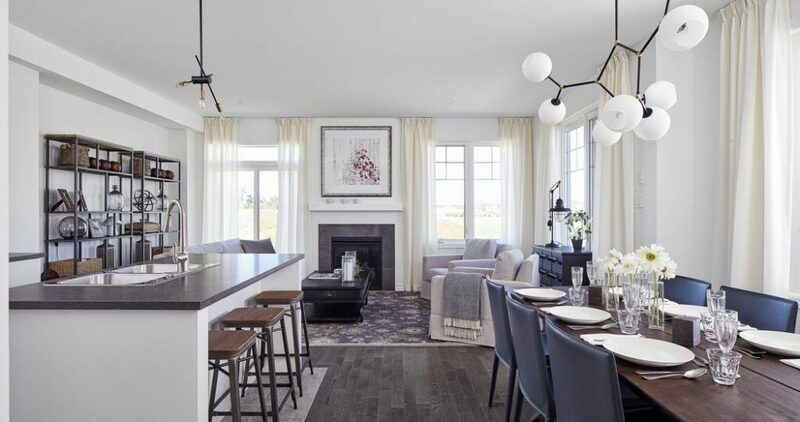 RND also won three awards for its Meadow model home at Riverpark Green, sharing two of those wins with frequent collaborator Chris Simmonds and the third with Deslaurier Custom Cabinets. RND president Roy Nandram said his green awards point to the future of home building, including Net Zero homes, which generate as much energy, through solar panels, for example, as they consume. 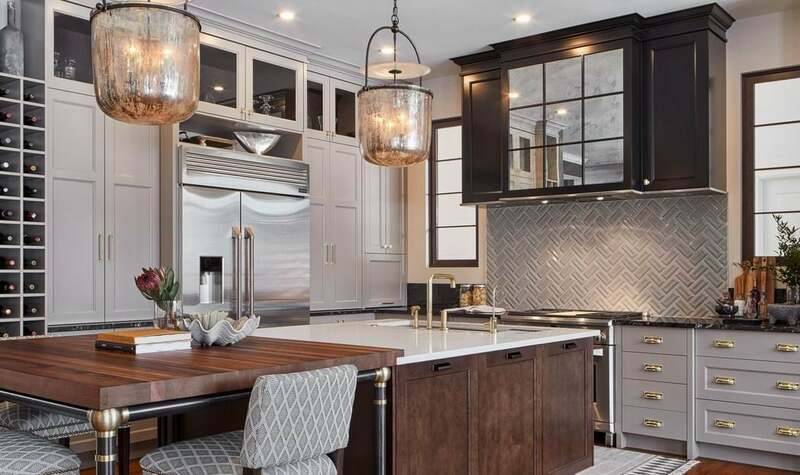 eQ, which claimed the production builder of the year award, scooped up two more, for Greystone Village (planned new community) and for its new double-car townhome model. Greystone was also a winner at last year’s sales and marketing awards put on by GOHBA. “There’s some great respect paid to the original buildings and using them as a backdrop for some public spaces around which new streets were laid out,” Lemke said of Greystone. 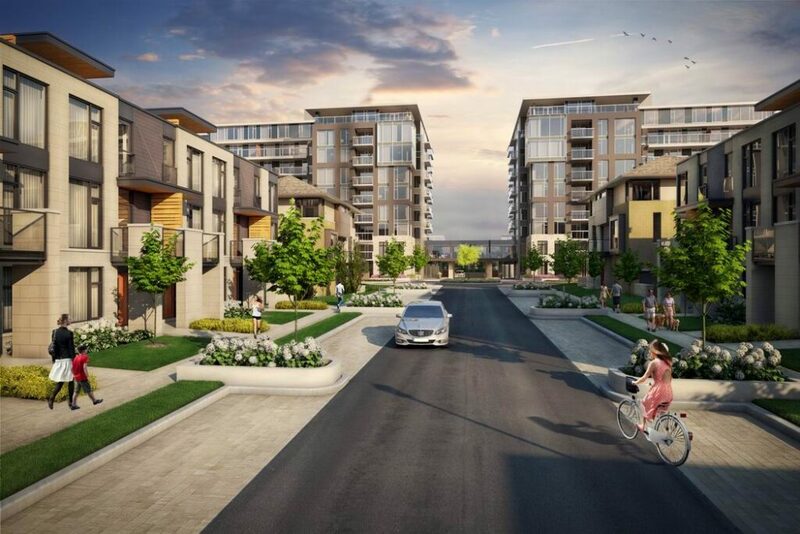 Greystone is a mixed-use development of about 900 homes, plus retail, commercial and community use spaces being built on the former site of the Oblate Brothers along the Rideau River in Old Ottawa East. 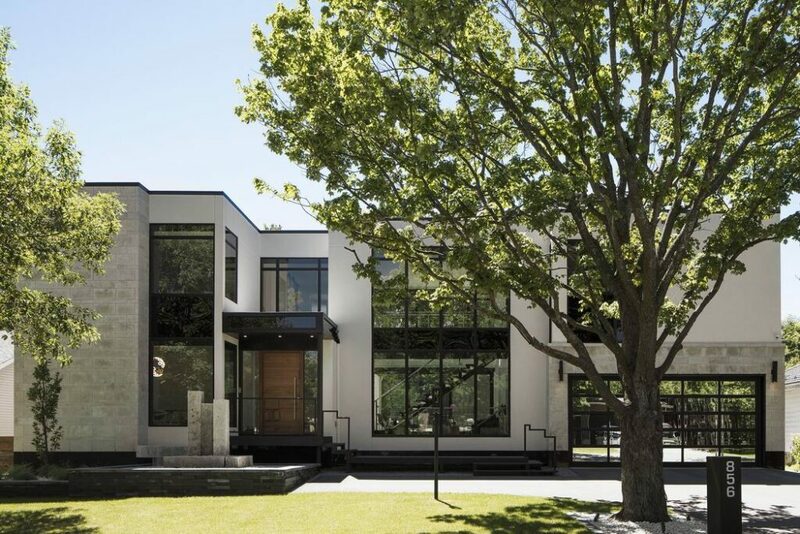 Renovator of the year went to Lagois Design-Build-Renovate, which last won the category in 2011. 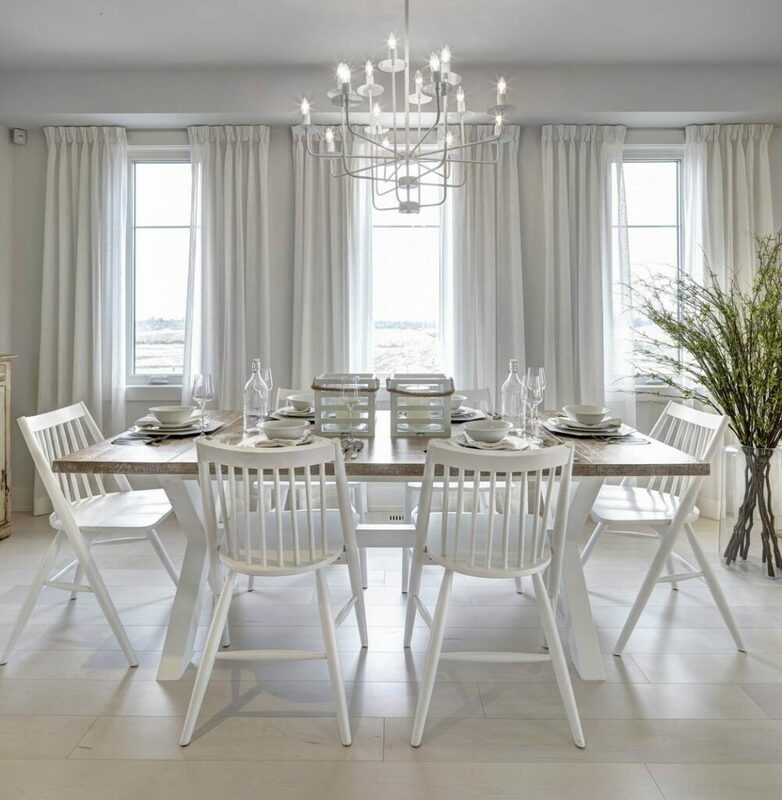 Lagois also won the renovation $200,001 to $350,000 category for a warm and inviting riverfront home in Manotick. 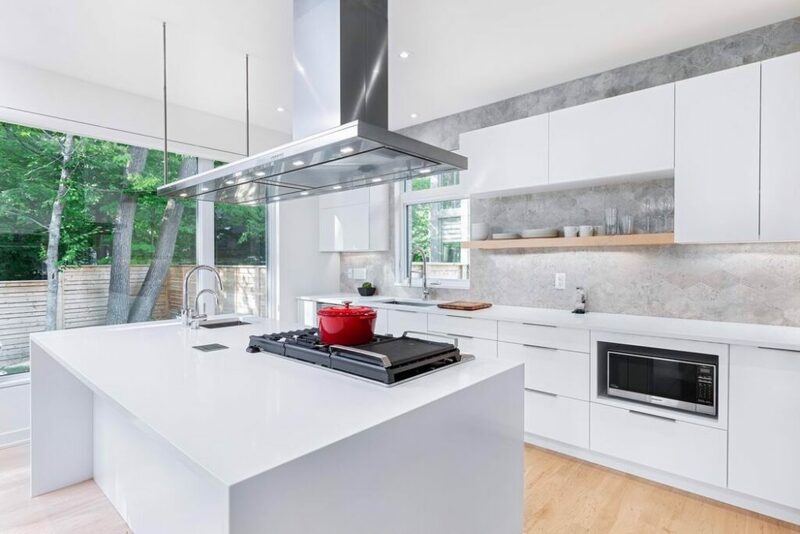 And designer of the year was won by Project1 Studio, which also won the renovation $500,001 and over (along with newcomer Novera Homes) for a beautiful Rockcliffe Park makeover. Winner: Renovation $500,001 and over. 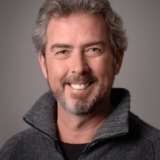 In a poignant moment, last year’s designer of the year, Friedemann Weinhardt of Design First Interiors, was remembered by the association with a standing ovation and the posthumous awarding of the Enbridge Hall of Fame award. 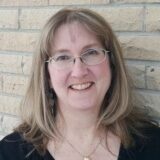 “We remember Friedemann and honour the legacy he left in our industry,” awards committee chair Linda Oliveri Blanchard said earlier in the evening. Weinhardt died unexpectedly in August after a fall from a ladder. In accepting the award, his life partner Welwyn Wong told the crowd, “I lost my best friend, my partner and my confidante… and Ottawa has lost a homegrown celebrity. Most of the categories this year were judged by a dozen industry experts from across the country. Following the judging but before the winners were announced, several indicated they were impressed by the quality of the entries. 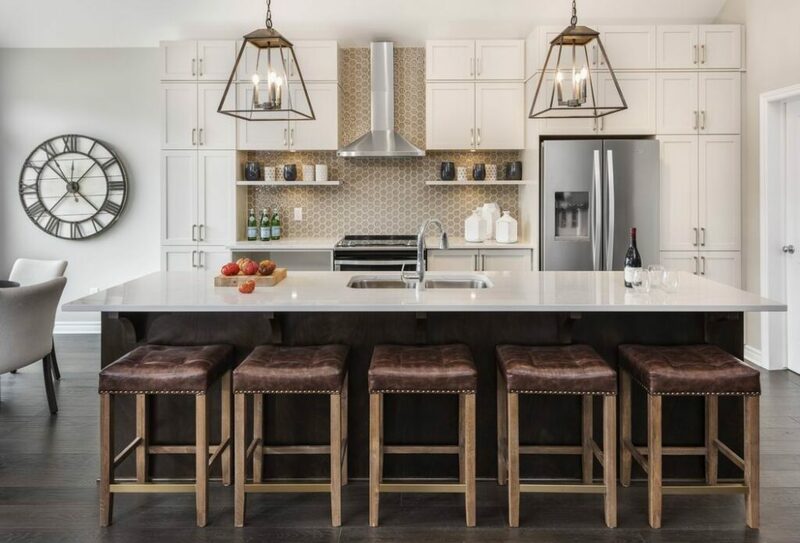 Saran judged the production and custom homes categories, as well as the condo categories (the categories were divvied up among the judges so that no one judge assessed every single category). Hewett, who was the only local judge and who was back for the 12th time, judged kitchens and bathrooms along with his usual green categories. He found minimal colour palettes being used. “Very black and white, very stark contrast,” especially when it came to dark veining in marble or marble-look materials. “Some of those veinings were very dominant,” he said. 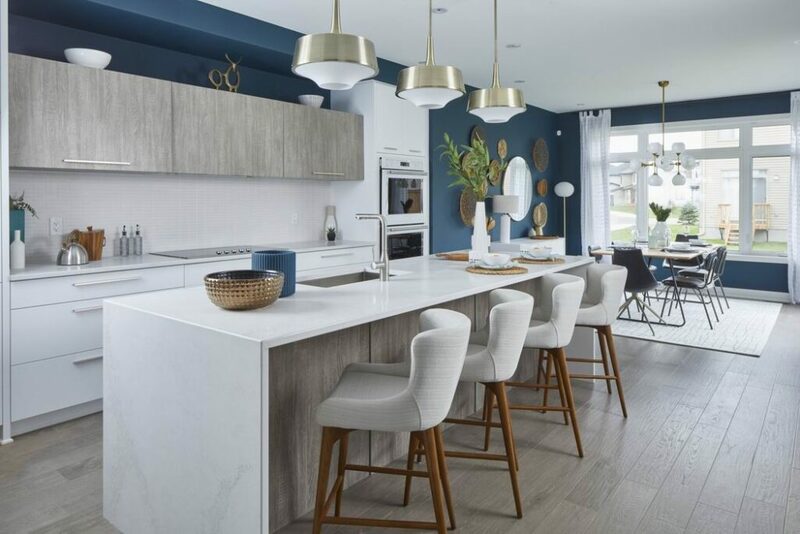 But another judge who also covered kitchens and bathrooms, Alana Loranger of Towne & Countree Kitchens in Edmonton, found that colour was starting to return. 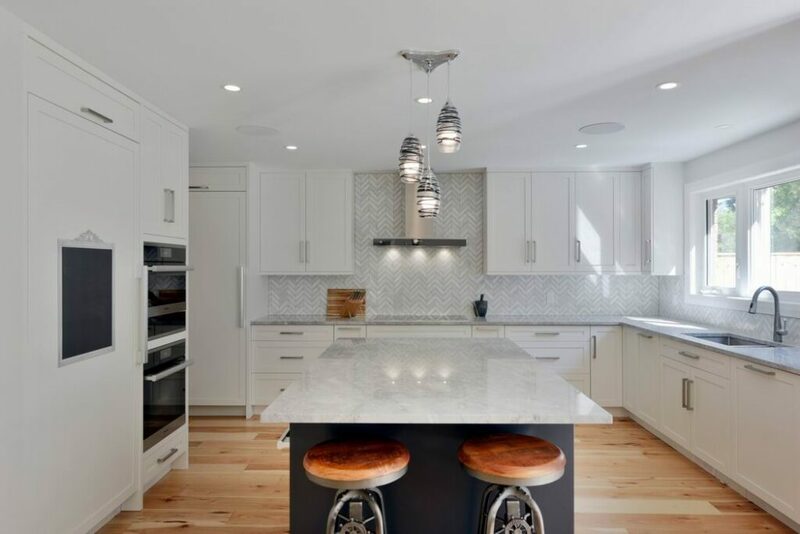 While it wasn’t blue or yellow, one of her favourite projects was a kitchen by Astro’s Nathan Kyle that also won at the NKBA Ottawa awards in the spring. Winner: Custom kitchen, 181-240 sq. ft., traditional. One project in particular stood out for judge Koen de Waal as well: the green custom home of the year by RND and Arca-Verde Inc. Winner: Green custom home of the year. Production home attached, 2,001 sq. ft. or more: Cardel Homes, the Balsa. Production home, single detached, 2,000 sq. ft. or less: Minto Communities, the Butternut. Production home, single detached, 2,001-2,600 sq. 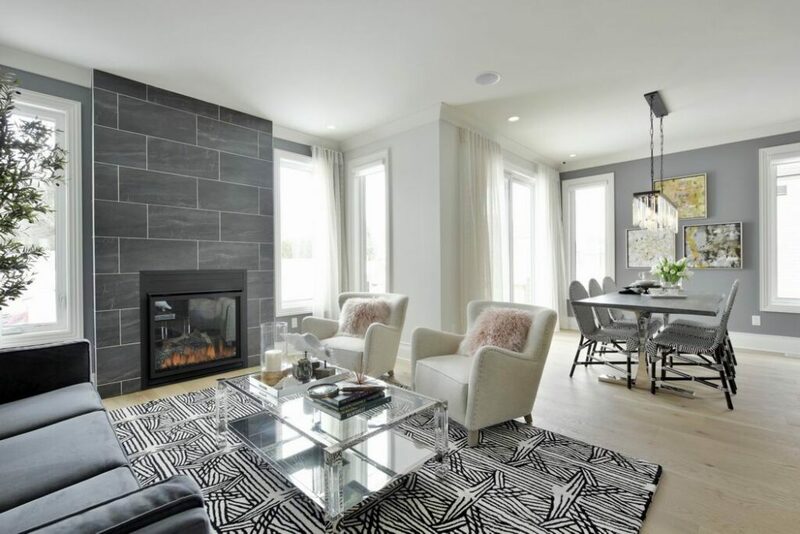 ft., $500,000 and under: Tartan Homes, the Summerhill. Production home, single detached, 2,001-2,600 sq. 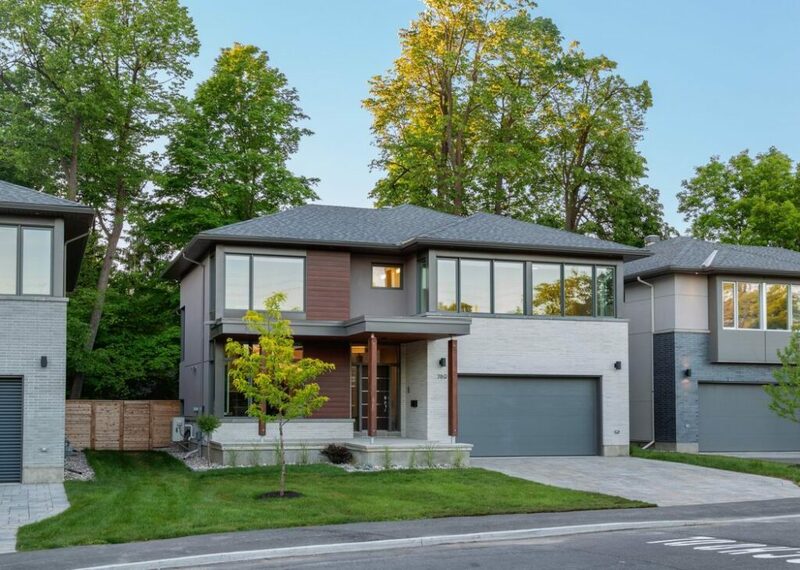 ft., $500,001 and over: Richcraft, the Beechside. Production home, single detached, 2,601-3,500 sq. 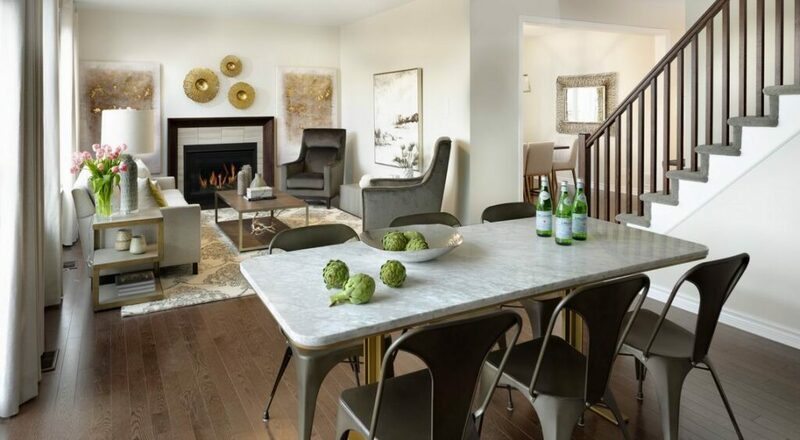 ft., $750,000 and under: Caivan Communities, Fox Run Series II, Plan 2. Production home, single detached, 2,601-3,500 sq. 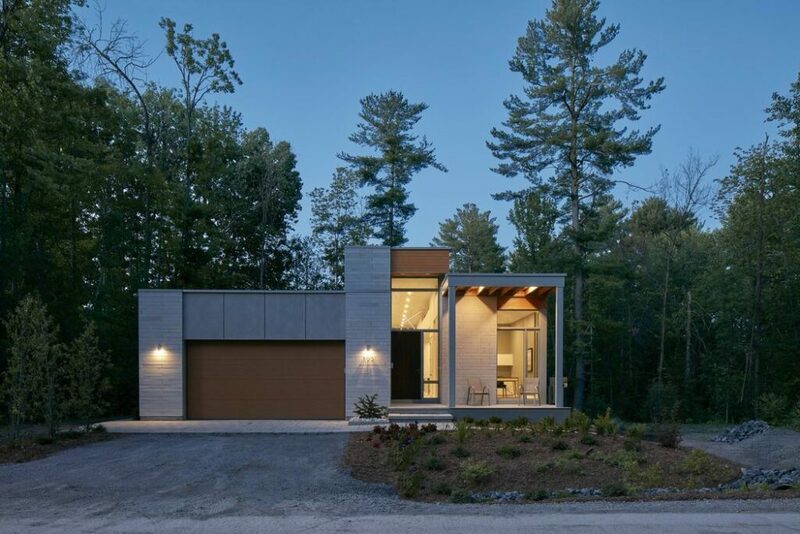 ft., $750,001 and over: RND Construction & Christopher Simmonds Architect, the Meadow. Production home, single detached, 3,501 sq. ft. or more: Minto Communities, the Red Maple. 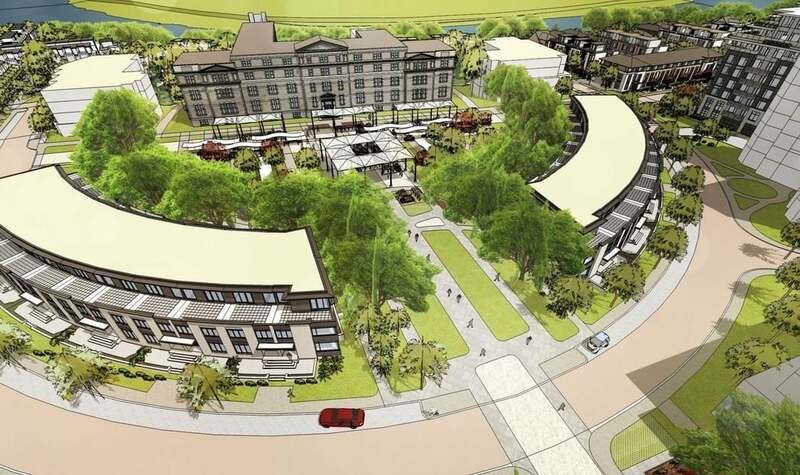 Planned new community: Hobin Architecture & eQ Homes, Greystone Village. Built new community: Hobin Architecture, the Haven. Production kitchen, 160 sq. ft. or less: Tartan Homes, the Tweed. Production kitchen, 161 sq. 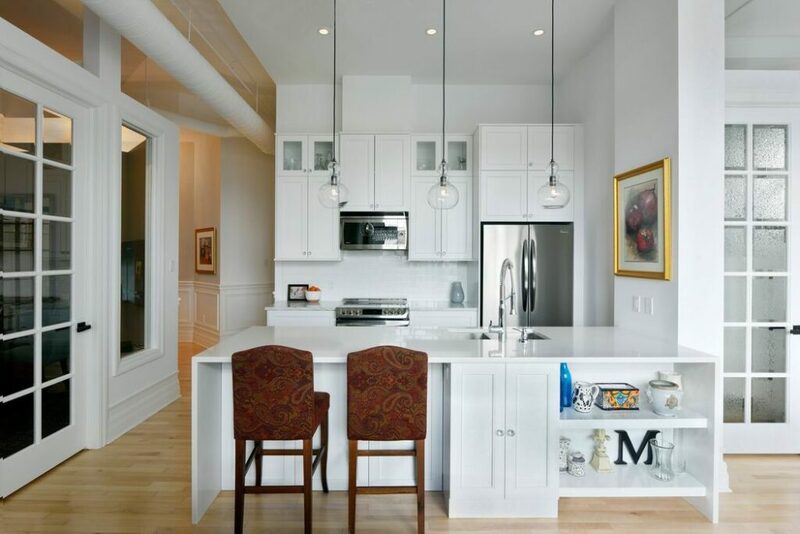 ft. or more: Deslaurier Custom Cabinets & Uniform Urban Developments. 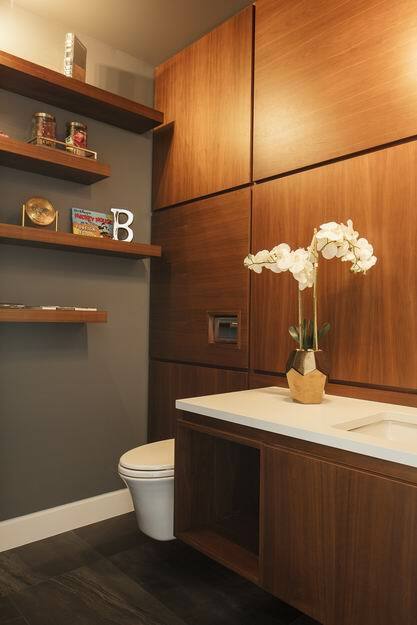 Production bathroom: Deslaurier Custom Cabinets & Uniform Urban Developments. Custom kitchen, 180 sq. 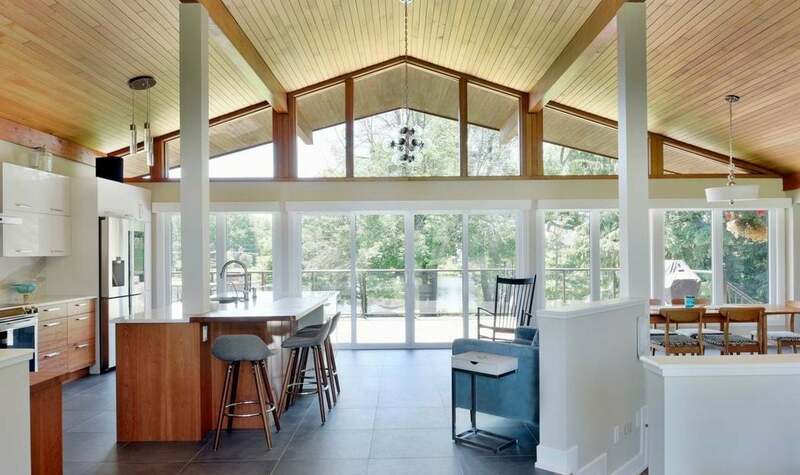 ft. or less, traditional: Amsted Design-Build. Custom kitchen, 180 sq. ft. or less, contemporary: Denys Builds Designs. Custom kitchen, 181-240 sq. ft., traditional: Astro Design Centre. Custom kitchen, 181-240 sq. 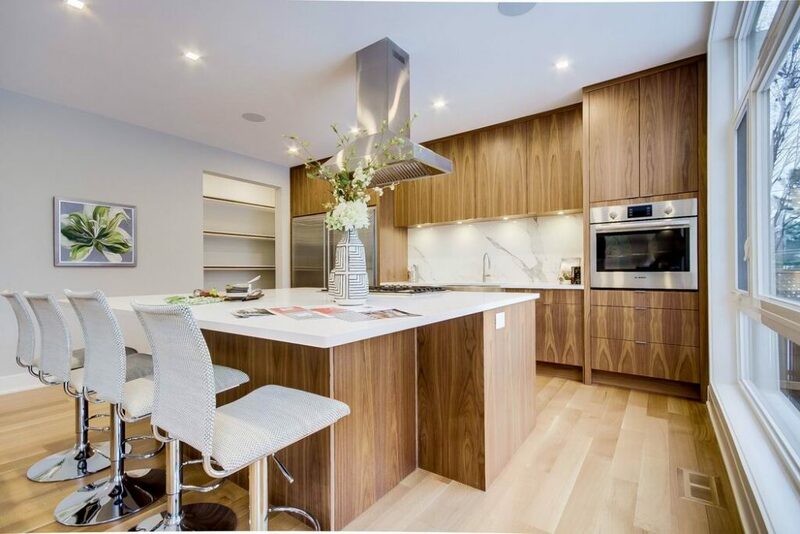 ft., contemporary: RND Construction & Deslaurier Custom Cabinets. Custom kitchen, 241 sq. ft. or more, traditional, $75,000 and under: Neoteric Developments. Custom kitchen, 241 sq. ft. or more, contemporary, $75,000 and under: Astro Design Centre. Custom kitchen, 241 sq. 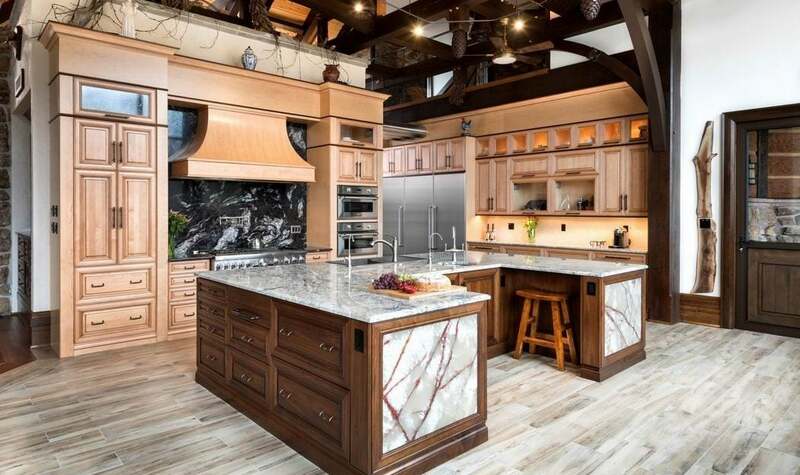 ft. or more, traditional, $75,001 and over — John Laurysen Memorial Trophy: Laurysen Kitchens & Lépine Corporation. Custom kitchen, 241 sq. 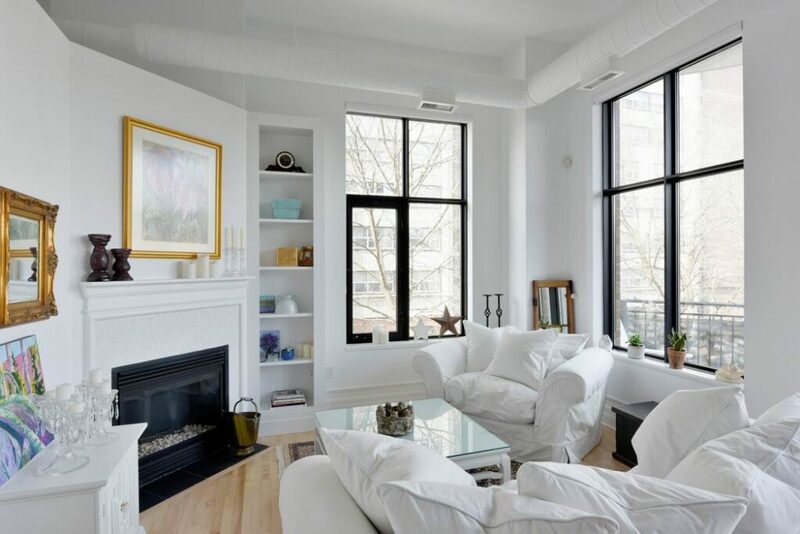 ft. or more, contemporary, $75,001 and over: Linebox Studio & The Lake Partnership. Custom bathroom, 100 sq. ft. or less, traditional: Sunter Homes. Custom bathroom, 100 sq. 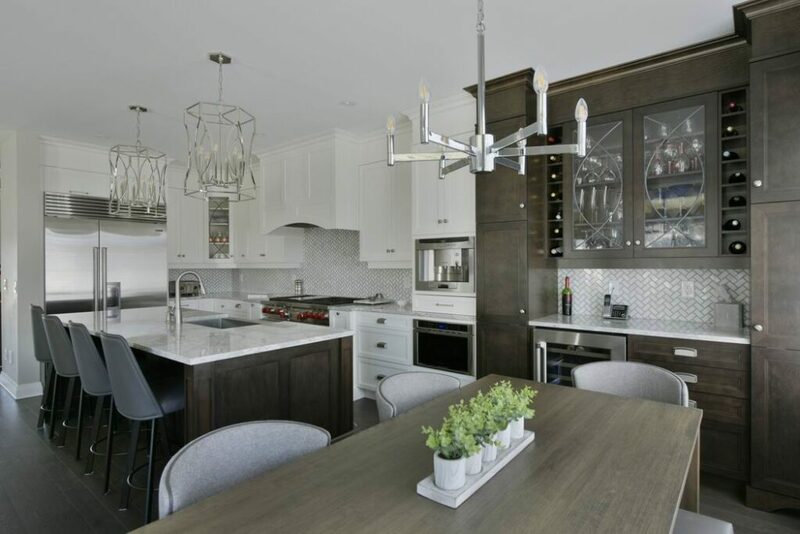 ft. or less, contemporary: Laurysen Kitchens & Minto Communities. 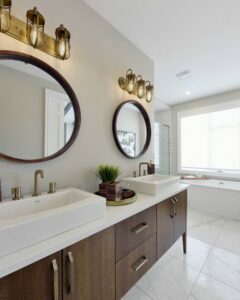 Custom bathroom, 101 sq. 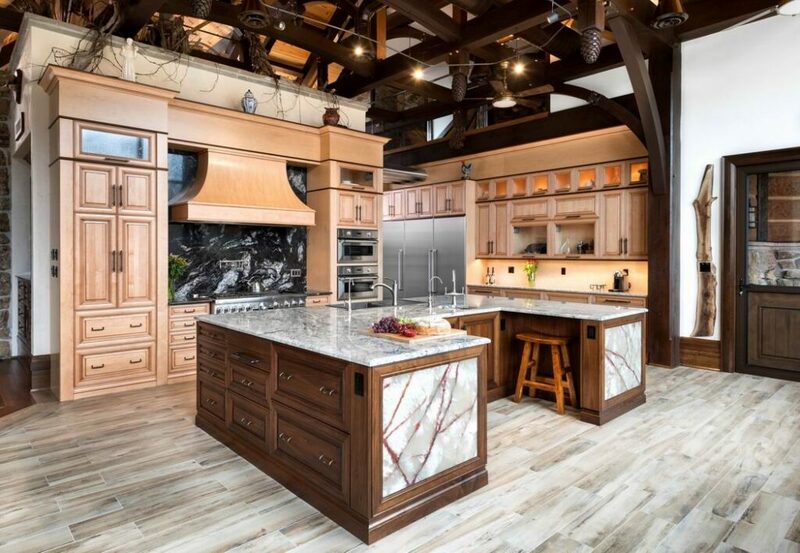 ft. or more, traditional: Laurysen Kitchens & Minto Communities. Custom bathroom, 101 sq. ft. or more, contemporary: Astro Design Centre. 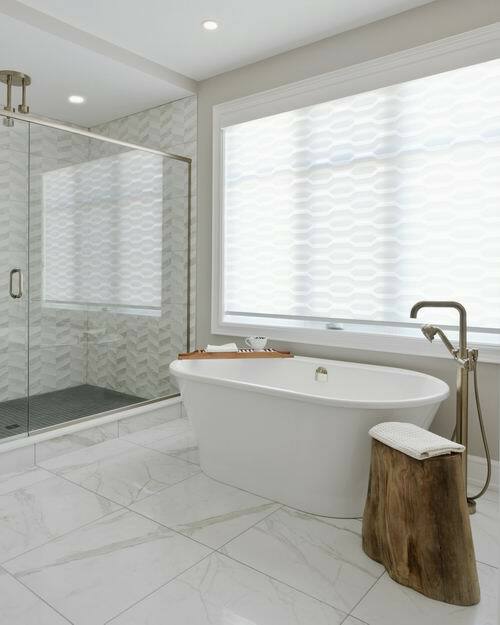 Custom bathroom, powder room: Neoteric Developments. Custom home, 2,400 sq. 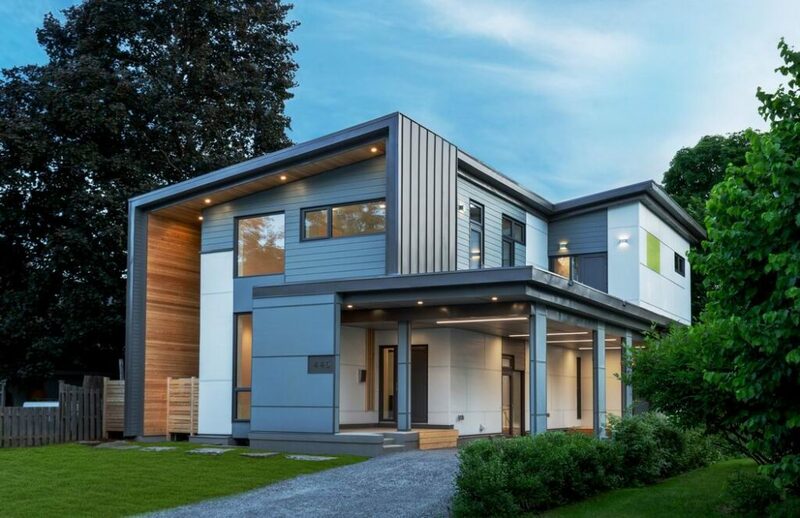 ft. or less: Christopher Simmonds Architect & Maple Leaf Custom Homes. Custom home, 3,501 sq. 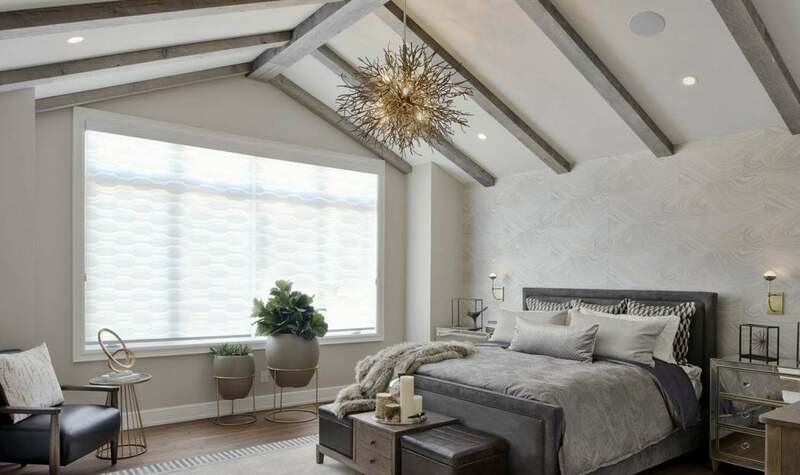 ft. or more: Christopher Simmonds Architect & Maple Leaf Custom Homes. Custom urban home, 2,400 sq. 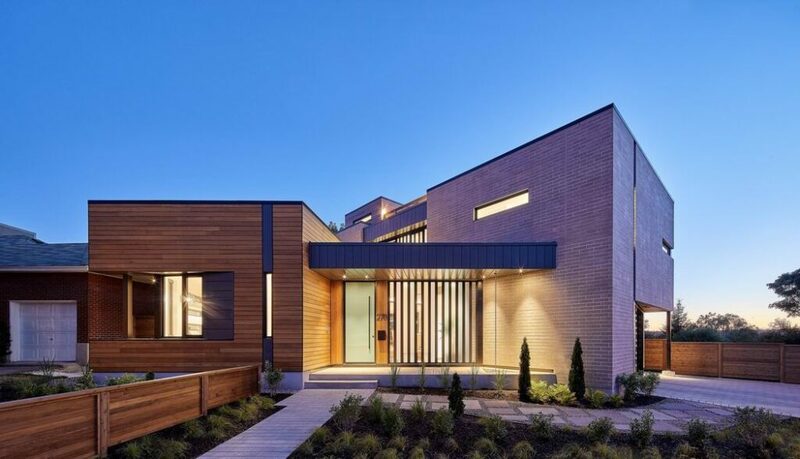 ft. or less, contemporary: Tomic Construction & Shean Architects. Custom urban home, 2,401-3,500 sq. ft.: Hobin Architecture. Custom urban home, 3,501 sq. ft. or more: Linebox Studio & The Lake Partnership. 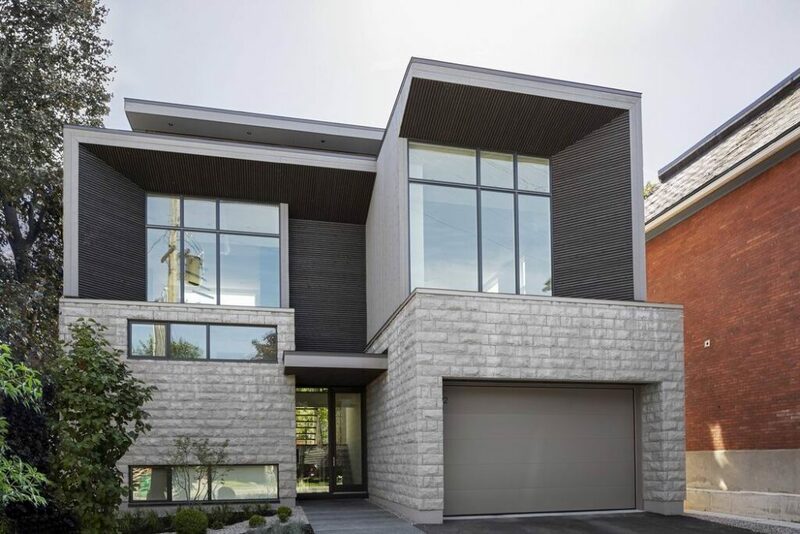 Custom urban home, multi-unit: Rosaline J. Hill Architect & Sherbrooke Urban Developments. 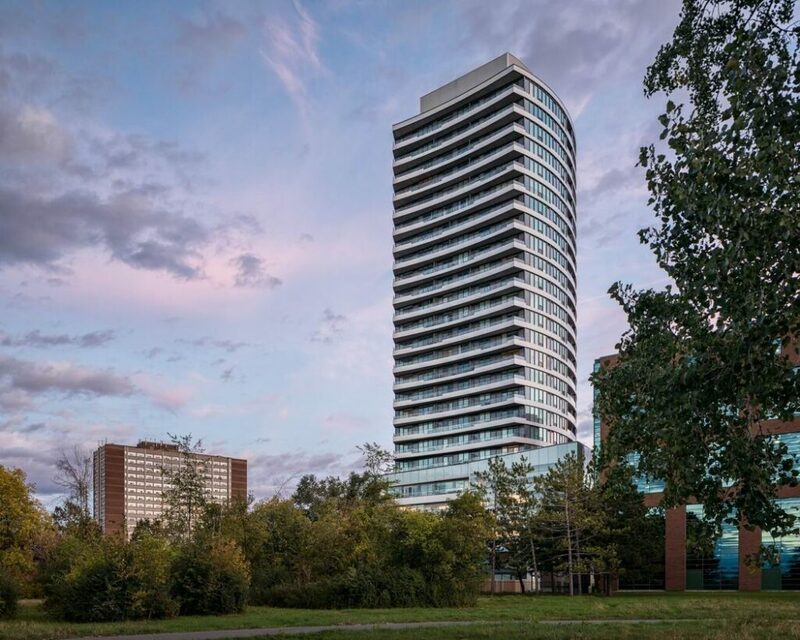 Mid-rise building, 5-9 storeys: Minto Communities, the Beechwood. High-rise building, 10 storeys or more: Minto Communities, UpperWest. Low-rise suite: Uniform Urban Developments, Hobin Architecture & 2H Interior Design, the Vista. Mid to high-rise suite, 501 sq. ft. or more: Southam Design. Renovation under $100,000: Amsted Design-Build. 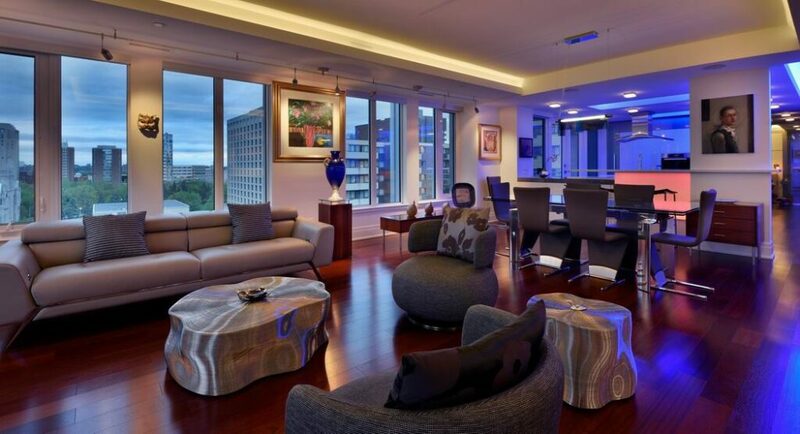 Renovation $100,001-$200,000: Artium Design Build. 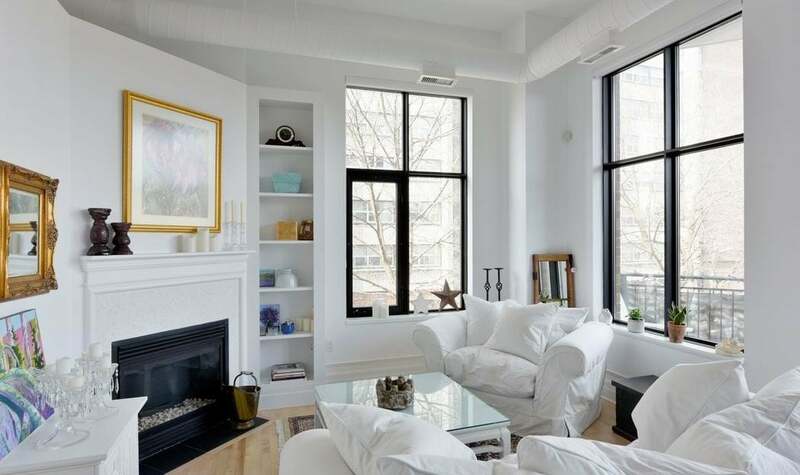 Renovation $200,001-$350,000: Lagois Design Build Renovate. 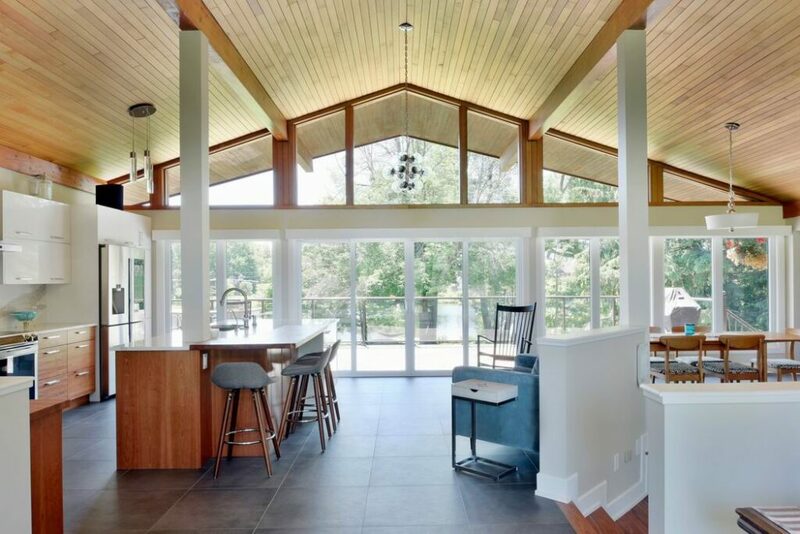 Renovation $350,001 to $500,000: Amsted Design-Build. 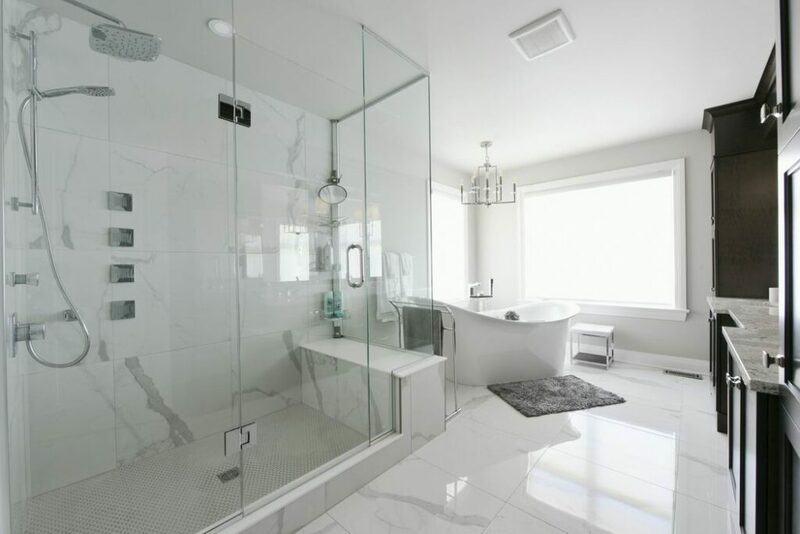 Renovation $500,001 and over: Project1 Studio & Novera Homes. Housing details: Linebox Studio & The Lake Partnership. Any room in the house: Hobin Architecture, 2H Interior Design & Cada Construction. Exterior details: Art House Developments. Exterior living space: Neoteric Developments. Anywhere in the world: Linebox Studio. Green production home of the year: RND Construction & Christopher Simmonds Architect, the Meadow. 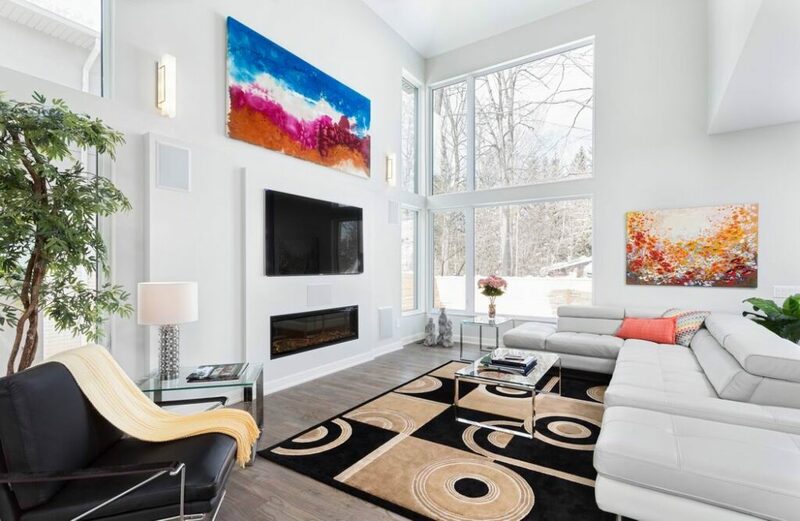 Green custom home of the year: RND Construction & Arca-Verde Inc.
Ottawa Citizen People’s Choice Award: Neoteric Developments.